Well put, sir, well put. I'll cerintaly make note of that. ..
Military cell phone lockers offer personal storage space to both military personnel and civilian staff who work on base. They feature a material build that consists of heavy duty metal that will withstand a wide range of climates and constant, repeated usage. In addition to providing a convenient place to store personal mobile devices, these lockers also have plenty of room where people can store personal items and valuables. Lockers can be mounted in a variety of locations, and they come in several different sizes. Perhaps most importantly, they provide secure storage for users while at the same time allowing for authorized access to their contents by authorities in charge of investigations or inspections. Heavy duty construction is essential for long-term return on investment. Lockers may not always be installed in military barracks. There may be other facilities, both on and off base, where convenient, secure, and personal storage space will be required. Some of these areas may be in places where the lockers are exposed to the outdoor elements or to chemical agents in the air. It is important that Military cell phone lockers be made of heavy duty metal that can withstand exposure to temperature changes, salt air, and any airborne chemicals present in the atmosphere. Their solid construction, further protected by a durable powder coat finish, also helps them hold up to constant usage and ensures lasting performance for well over a decade. The ability to store other items besides a cell phone in the locker is one of the key advantages this unit offers to both service men and women and civilian staff on base. Keys to personal vehicles, wallets, small purses, video cameras, tablets, and even small laptops can be stored within the individual compartments. Locker compartments are 8 inches deep and feature door sizes of 6 ½ inches X 5 ¼ inches or 13 inches by 5 ¼ inches, depending on the model. Name plates can be ordered to designate individual compartments to each user, if necessary. Custom door engraving is another option for officer barracks. 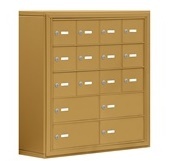 Military cell phone lockers can be mounted in many different locations. They are ideal for gym areas, training areas, educational areas, and office areas. Military officials can choose between several models we offer that have anywhere from 10 to 25 doors. This selection allows facility managers on base to make the most efficient use of space and still accommodate the number of users present. Security is perhaps the most important feature of any locker. Locking mechanisms should be simple for the user to operate, but difficult for anyone but authorized personnel to access. 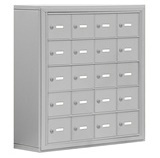 These personal storage lockers feature a variety of security options that make them highly effective for life on base. They can be manufactured with resettable combination locks built into the doors. A master control key allows M.P.’s and officers access to military cell phone lockers during investigations or inspections. It also allows them to reset the combination when the unit changes users, or if a user forgets the combination. This article was published on Wednesday 05 September, 2012. Where Can Bradley Lennox Lockers be Used?